Position: Authorized representative in India, scientific consultant at Fluidtherm Technology (India) and Owner of PC LADOTHERM, Ukraine. 2003 Ph.D. in Industrial Heating and Thermal Physics, Gas Institute of NASU, Kyiv, Ukraine. 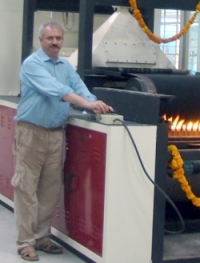 Prof. Tendulkar National Award (India) for the best presentation at PMAI-2006 on the theme of Hot Gas Atomization. Award from the Ministry of Industry of Ukraine for personal input in the development of National Metallurgy 2009. D. Fedorov. Recycling of Secondary Materials to Obtain Copper Powder. Powder Metallurgy for Automotive and Engineering Industry. Editor P. Ramakrishnan. - Naros Publish House. New Delhi- Chennai - Mumbai - Kolkata. - 2009.- p. 131-136. ISBN-978-81-7319-934-9. A.Nebesny, D.Fedorov, N.Gopinath. Furnaces for iron powder production by hydrogen reduction method. - Proceedings of 5th International Conference “Metals, Welding and Powder Metallurgy” MET-2007, Jurmala, Latvia, 13-14 September 2007, p.69-77. ISBN 978-9984-32-649-2 © Rigas Tehniska universitate, 2007. L.Dovgan, D.Fedorov. Study of influence of initial materials and alloying process on properties of ferrous powders. - Proceedings of 5th International Conference “Metals, Welding and Powder Metallurgy” MET-2007, Jurmala, Latvia, 13-14 September 2007,p.41-48 ISBN 978-9984-32-649-2 © Rigas Tehniska universitate, 2007. J.J. Dunkley, D. Fedorov and G. Wolf. A theory of hot gas atomization. 2006 Powder Metallurgy World Congress. Korean Powder Metallurgy Institute. Buxan. S. Korea. p. 10-11. Федоров Д.Н. Анализ Соотношения Стоимости Шихты Из Вторичных Материалов и Стоимости Их Передела При Производстве Железных Порошков. - Экотехнологии и Ресурсосбережение. - 2006. - № 6. - с.63-66. Patent No 211922, India, IC B 32 B009/00 - A Method and device for applying a protective carbon coating on metallic surfaces / B.I. Bondarenko, Y Pokotylo, A. Sviatenko, D. Fedorov, Malobika K., A. Sivakumar. - Official Journal of the Patent Office issue No 41/2006, 13.10.2006. D. Fedorov John J. Dunkley. Theoretical advantages of hot gas atomisation of melts. TRANSACTIONS OF POWDER METALLURGY ASSOCIATION OF INDIA. Volume 32, December 2006, pages 11-16 National Conference on Powder Metallurgy at its Best and 32nd Annual Technical Meeting with Exhibition (PM2006), Hyderabad, India.- January 23-24, 2006. D. Fedorov. Theoretical background of Hot Gas Atomization of melts. – PM2005 Euro Congress. Conference Proceedings. Volume 2. – Prague, Czech Republic. – 2005. – p. 3-8. D. Fedorov, Malobika Karanjai, Dr. R. Sundaresan, A. Sivakumar. Selection of alloying method to produce low alloyed iron-based powder. // Порошковая металлургия. – 2005. - №5/6. – c. 8-13. Федоров Д.М. Енерготехнологічне дослідження та вдосконалення виробництва залізного порошку. Автореферат канд. дис. Київ.- Академ періодика.- 2002. – 24с.